Museum 2.0: What Tools Do You Use to Organize Your Work? One of the benefits of being Jewish is the opportunity to work over the Christmas week in peace. It is the most focused time of the year for me--a great time to close out projects and prepare for the new year. For me, the end of 2013 coincided with a clear need to improve my general approach to list-making, task-recording, and note-taking. In 2013, I found myself constantly shaking my notebook and hoping that the needed bit of information would drop out. Until I figure out how to turn a notebook into a magic deck of cards--or at least embed a Command-F function into it--I need a better system. There's a whole industry of tools and tips for getting things done, and I don't intend to add this blog to that empire. But I figure that we all have come up with tools that help us, both individually and in teams, to organize our work. I wanted to open up this post to your favorite approaches, especially simple things that don't require specialized software etc. Added a Today list to my to-dos. I've always had a long task list on my desktop. I used to separate the list into two parts: "This Week" and specific projects. I almost exclusively worked from the This Week list, but it rarely got shorter and it became clear over time that some things on This Week were actually more like This Century. So I've added just one simple component to this list system: a list at the top called "Today." In the morning, first thing when I come in, I move things from This Week to Today and also add other things. I try to truly only include things I think I can accomplish that day, being mindful of my calendar. My rule of thumb is that I should be able to close out the Today list by noon. This means that most days, I finish the Today list, feel good about that accomplishment, and feel ready to "pull up" something from This Week to work on later in the day. I'm amazed at how This Week is getting smaller, even as new projects continue to come up. Blocking time on my calendar to work on projects. My calendar tends to be quite open a few weeks out, but totally packed within the next fourteen days. If it doesn't get calendared, it will get squeezed out. I had blocked time for grant proposals in the past but now have expanded this practice to other work that requires concentrated blocks of time. Separated Tasks from Notes. My notebook used to have both tasks and notes, which made it a mix of big ideas and time-limited, potentially trivial activities. 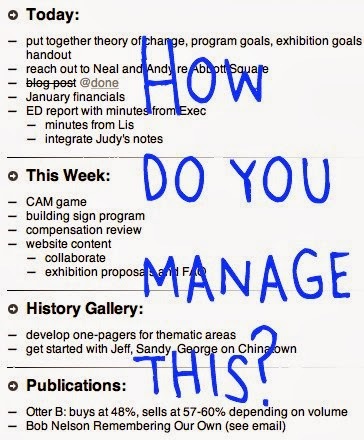 Now, I use the notebook strictly for notes, and I use a mixture of my digital task list and scrap paper for task lists. Added a Table of Contents to my new notebook. This meant doing two things: numbering the pages and leaving a few blank in the front for the Table of Contents. I'm sure I could do this better, but for now, I just put a couple of big ongoing project headings in the Table of Contents and started marking pages on which notes for those projects occur. Started using Follow Up Then. OK, this is a piece of software, but it's free and super-easy to use. FollowUpThen is a system that allows you to forward any email to yourself at a time in the future ("monday" or "march2" or "2pm"). The email will pop up in your inbox at the designated time. I use this tool to clear my inbox of things that I need to follow up on eventually but not now. I get a couple hundred emails each day, and this allows me to focus on what I need to do and not waste time scanning my inbox and re-acquainting myself with things I guiltily feel that I should do. When something pops up from FollowUpThen, I know it's something I should consider to be on my "Today" list. What do you use to lasso your tasks, goals, and dreams?